Ian has discovered how to climb things. Stools are his favorite and he's been using the nursing stool for getting up on the sofa himself. 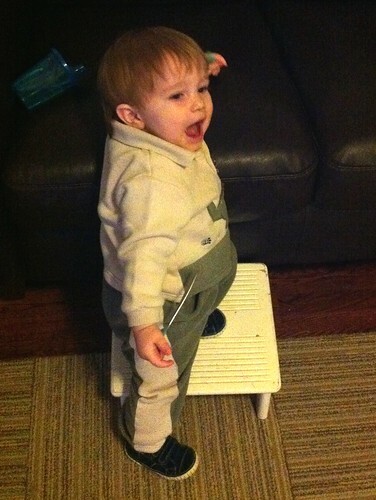 I stopped by Mom's with him this evening and he found a stool there too to climb on. So far his falls off the stools have not been that epic. But it's only a matter of time. He has two bruises on his face today. One from slipping and hitting his face on the front of the stove. And the really big one is from our butthead dog totally bulldozing him down in her spastic attempts to go out back. She literally mowed him down and drove his face into the door frame. Bad dog!